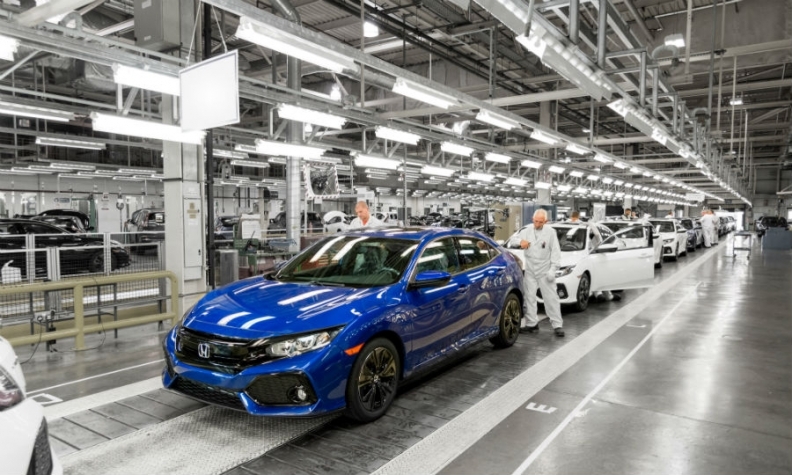 Honda builds European hatchback versions of its Civic compact car in Swindon. LONDON -- Honda cannot afford the 10 percent export tariff that would be imposed on its UK-built cars if Britain had to return to World Trade Organization rules after Brexit, it said on Thursday. The warning is the latest from a car industry worried Britain might lose access to the European Union's single market and customs union when it leaves the bloc in 2019. The auto industry has been a rare manufacturing success story for Britain, with production reaching a 17-year high in 2016. But with Brexit talks at an impasse, several of its mostly foreign-owned manufacturers have warned they might have to move work elsewhere if favorable trading terms are not maintained. "A 10 percent tariff would make our vehicles uncompetitive, and would impose costs we cannot afford to absorb," Honda said in a submission to parliament's business committee. The Japanese carmaker builds around 8 percent of Britain's 1.7 million cars at its southern English plant in Swindon. Ministers have repeatedly said they will seek a deal which guarantees the freest possible trade with the EU, the car industry's biggest export market. Honda, which has been less vocal on Brexit than its peers over recent months, also said any work on customs could divert funds from rolling out greener vehicles. "Tying up capital in mitigating customs risk would reduce the amount of resource we could dedicate to introducing new hybrid and electric vehicles into the UK marketplace," it said. In submissions to the committee, Honda, Ford and Vauxhall - the British arm of PSA-owned carmaker Opel - called for a transitional deal that would come into force after Britain formally leaves the EU in March 2019. Vauxhall warned that without clarity on trading arrangements after that date, the firm would have to stockpile components to mitigate against any customs checks that would slow the movement of goods between Britain and the continent. "To protect our 'Just-in-Time' operations we would have to invest in warehousing to enable stocking of parts to accommodate any delay at the border," the company said in its submission. Ford, which operates two engine plants in Britain, also warned that any additional customs checks, excise duties and procedures as a result of Brexit could "have a serious and negative impact on cash-flow."